Welcome to Lynn's Pharmacy's web site. Our Home Page is actually a companion web site. 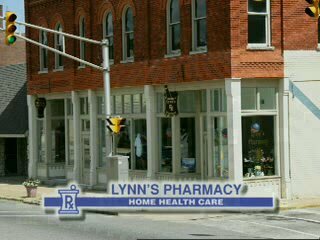 You will find a wealth of information there, plus you can order your prescriptions from Lynn's on-line. At Lynn's, we are able to compound prescriptions and other medications in our pharmacy; very few chain pharmacies are able to do that today. Whle you're here, stop in our Soda Parlor and see what we offer in our Home Medical Care department. I will be posting weekly "blogs" (which will open in a separate tab in your browser) and you can hear my weekly radio show on WCLS 97.7 (Sundays 9:15am) and WAXI 104.9 (Sundays 8:15am). Our pharmacy staff is shown below. We often tout a quality fish oil supplement as a very important way to enhance your immune system. There are many fish oils, krill oils, etc. on the market and more and more people are supplementing with fish oils. But...not all of these products are the same. Read the labels! Click here and read this chart (You must have Adobe Reader on your computer) comparing the Nordic Natural Fish oil capsules sold by Lynn's Pharmacy with some other popular products on the market today. Dollar for dollar, which do you think is best?